For your information: Those seeking Billy Boyd's autograph will need to be present at Beecake's shows. He'll only be signing items there. So don't forget to catch Beecake at Joe's Pub during the Radio City weekend. I think I'll be stopping by as well, if my schedule holds. Should be great fun! Sorry for the inelegant linking, I'm posting remotely again. Additional announcements due in 24 hours... or so I'm told! I'm receiving numerous emails regarding autograph opportunities during the upcoming New York week. At this point, the only scheduled autograph opportunity I know of is at the B&N event on Oct. 3. That doesn't mean there won't be others, this is just all I know at the moment. I would assume there will be post-concert autograph sessions at Radio City, but I don't know that for a fact. It's entirely possible that I won't know until the evening of. My email time is going to be extremely limited during the next two weeks. While I'll do my best, it would be helpful if you could post your questions on the blog. The excellent and admirable folks around here are quite knowledgeable indeed, and often answer the questions before I'm personally able. The press coverage continues! MTV's Movie Blog is running a nice article on the upcoming Paley Center talks. But perhaps more importantly, they're also offering tickets at 50% off. Quite a deal! I'm not sure where this deal came from -- or how long it will last -- so you may wish to jump on it sooner rather than later. Incidentally, the Paley planners chose their Fellowship movie clips yesterday so that our motley crew will actually have something to discuss! Apparently some of the recent Radio City press made it to the IMDB.com front page today. See the screencap below. (Click for legibility.) Thanks to everyone who alerted me to the posting. Seeing my name along side Uma Thurman's gave me a pretty good laugh! The link, by the way, goes to a recent interview I did with The Gothamist, available here. There are a few errors in the piece, but we'll credit those to a markedly lousy phone connection. The Huffington Post also did a very nice piece today. 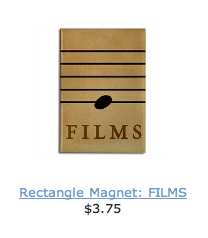 That's available here. I think the press will keep rolling right up until Radio City, so I'll try to keep everyone informed. Busy times! Billy Boyd, "Peregrin 'Pippin' Took"
Pippin: Well... yes. At least well enough for my own people. But we have no songs for great halls and ...evil times. The Lord of the Rings Academy Award-winning composer Howard Shore had no trouble conjuring up music for great halls, evil times, or any of the scenes depicted in Peter Jackson’s epic adaptations of J.R.R. Tolkien’s three novels about the great war for the “one ring to rule them all.” In anticipation of his much ballyhooed October 9 and 10 live performances of the full score of The Fellowship of the Ring as the film is screened at Radio City Music Hall, Shore visits the Paley Center to share his insights into his craft, and the many creative challenges posed by scoring The Lord of the Rings films. This event is in conjunction with The Lord of the Rings: The Fellowship of the Ring: Howard Shore's Score Performed by 300 Musicians Live to Film, Friday & Saturday, October 9 & 10, 7:30 pm, Radio City Music Hall. If interested, you can also submit questions through the Paley Center's website, though there's no guarantee that we'll be able to address them. If you'd told me back in 2001 that I someday be making public appearances with Howard Shore, Billy Boyd and Kurt Loder, I'd have laughed myself silly. Actually, I'd have responded pretty much the same had you told me this last week. It will be interesting to see how the conversation proceeds... and if I have anything to contribute other than "yeah" and a nervous cackle or two. 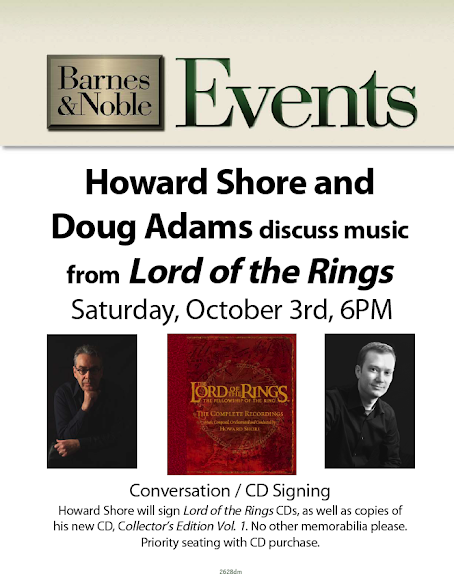 Join Oscar-winning composer Howard Shore as he discusses the music of The Lord of the Rings with Doug Adams. Now here's a discussion style I'm more familiar with! Although, I saw a proposed poster for the event yesterday with a big picture of my head and got a little short of breath. 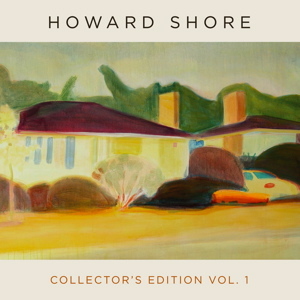 As one publicist commented to me, "Well, you look... trustworthy..."
We'll be rolling out HOWE Records new Collector's Edition Vol. 1 CD on October 3 at the big downtown Barnes & Noble. Those of you clamoring for the physical CD (rather than MP3s) will be able to get it here before anywhere else, so that's a pretty cool exclusive! And of course, we'll focus a good deal of our discussion on The Lord of the Rings and the forthcoming book. 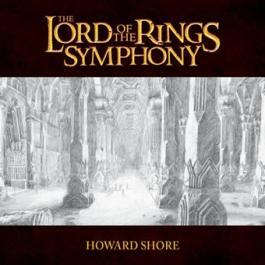 The talk, which is scheduled to last around 30 minutes or so, will be followed by a signing session, though only Howard Shore CD's can be signed. (Store rules.) We're also expecting the store to have an extra shipment of LOTR: CR sets on hand, so if anyone's still holding out, here's your shot. These will not be the only NY events at which Howard Shore and I will be appearing, so please keep watching for additional announcements! I'm woefully late in posting this Ongoing Discussion Thread. The August edition is now closed, so please move direct all conversation September-wards. Many announcements coming soon -- including the Radio City schedule of events. Check back often. I'll try to return as soon as possible with a lengthier update. Attention Radio City revelers: Billy Boyd--Pippin, himself--and Beecacke will be appearing at Joe's Pub in NY on October 8 and 10 (immediately following the Radio City show)! Details below. I think I'll be in attendance at least one of the nights. Hope to see you there! 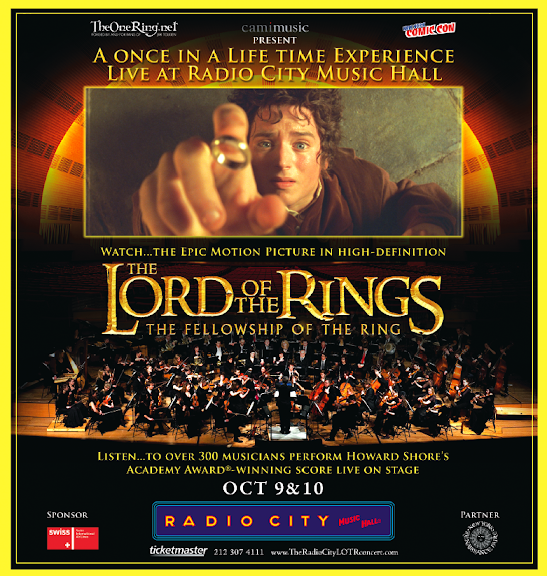 The tour will coincide with The Lord of the Rings: The Fellowship of the Ring - Howard Shore’s score performed live to film at Radio City Music Hall on October 9 and 10 at which Boyd will make an appearance. Beecake will be appearing at Iota Café in Arlington, VA on October 6, Tin Angel in Philadelphia, PA on October 7, Joe’s Pub in New York, NY on October 8 and 10 and Passim Center in Cambridge, MA on October 11. Billy Boyd attained worldwide fame and acclaim with his portrayal of Peregrin “Pippin” Took in Peter Jackson’s epic film trilogy adaptation of J.R.R. Tolkien’s The Lord of the Rings. Billy appeared in two of the Academy Award Nominees for Best Picture in the same year (2004): The Lord of the Rings: The Return of the King (which won 11 Academy Awards, including the Best Picture prize) and Peter Weir’s Master and Commander: The Far Side of the World (which won 2 Academy Awards). His other film credits include Stone of Destiny, On a Clear Day, Flying Scotsman, the voice of Glen/Glenda in Seed of Chucky, An Urban Ghost Story , The Soldier’s Leap, Save Angel Hope and an animated A Midsummer Dream (the voice of Puck). In post production at the moment are Glenn, Jusqu’a Toi (Every Jack has a Jill), Carmel and PIMP. Billy co-starred with Gregor Fisher in the BBC2 series EMPTY and will be seen later in the year in Jack Osborne’s ADRENALINE JUNKIE. A native of Glasgow, Billy is a graduate and Fellow of the RSAMD and has performed in numerous theatre productions in Scotland and the UK. 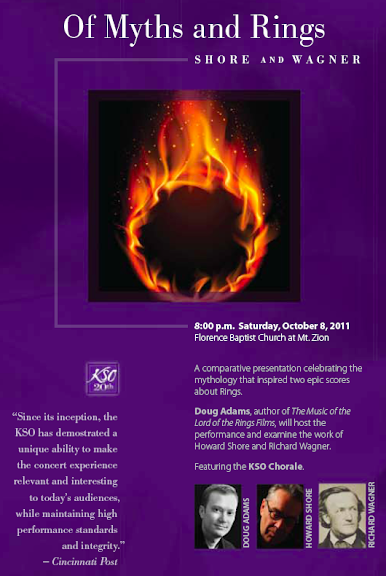 OCTOBER 6 at 7PM, Iota Café, Arlington, VA. For tickets, visit www.iotaclubandcafe.com or call (703) 522-8340. OCTOBER 7 at 8:30PM, Tin Angel, Philadelphia, PA. For tickets, visit www.tinangel.com or call (215) 928-0770. OCTOBER 8 & 10 at 10:30PM, Joe’s Pub, New York, NY. For tickets, visit www.joespub.com or call (212) 967-7555. OCTOBER 11 at 9PM, Passim Center, Cambridge, MA. For tickets, visit www.clubpassim.org or call (617) 492-5300. THE LORD OF THE RINGS: THE FELLOWSHIP OF THE RING - Howard Shore’s Complete Score Live to Film - with special appearance by Billy Boyd - plays at Radio City Music Hall on October 9 and 10 at 7:30PM. For tickets, visit www.radiocity.com/events/lord-of-the-rings-1009.html or call Ticketmaster at (212) 307-4111 or (800) 745-3000. It appears our ever-fluid plans have begun to flow into Sunday, October 11. If you're still planning to be in NY that day, I'd consider blocking out 10 a.m. to 2 p.m. if I were you. I'll keep you updated to the best of my ability... though issues of secrecy and, yes, fluidity conspire against me! Ongoing discussion update coming soon.